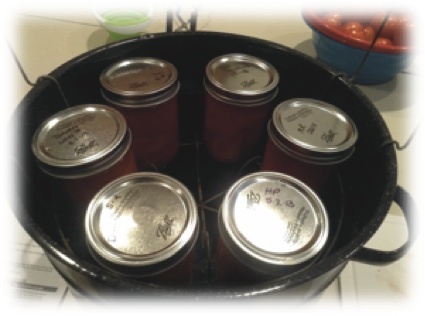 Canning tomato products can be easy and safe. Included in this fact sheet are recipes for various tomato products and answers to commonly asked questions such as, "How do I select tomatoes?" "Is it necessary to add acid?" "How do I prepare the tomatoes?" and, "What are the safe ways to process tomatoes to keep my family healthy?" Select only disease-free, preferably vine-ripened, firm fruit for canning. Do not can tomatoes from dead or dying vines. Unripe tomatoes are more acidic than ripened fruit and can be canned safely with any of the following recommendations. Treat all ripe tomatoes (yellow, green, pink, orange, red, etc.) the same. *Add acid directly to the jars before filling with tomato product. If desired, add up to 1 tablespoon of sugar per quart to offset the acid taste. Vinegar may cause undesirable flavor changes. The use of salt is optional in all canned tomato products. Salt can be used for flavor or color protection. Even though both boiling water bath and pressure processing times are given (see Tables 2 and 3), recent research shows that for some tomato products, pressure processing will result in a more nutritious and higher quality canned good. Recipes that specify pressure canning only may contain many low-acid ingredients and can be safely canned only in a pressure canner at the specified pressure. About 23 pounds of tomatoes are needed per canner load of 7 quarts; 14 pounds will yield 9 pints. A bushel yields 15 to 18 quarts of juice. Wash tomatoes, remove stems and trim off bruised or discolored portions. To prevent juice from separating, quickly cut about 1 pound of fruit into quarters and put directly into saucepan. Immediately bring tomatoes to a boil while crushing them. Continue to add and crush freshly cut tomato quarters to the boiling mixture. Make sure the mixture boils constantly and vigorously while adding the remaining tomatoes. After all the pieces have been added, simmer for 5 minutes. If juice separation is not a concern, then simply slice or quarter tomatoes into a saucepan. Crush, heat and simmer for 5 minutes before juicing. 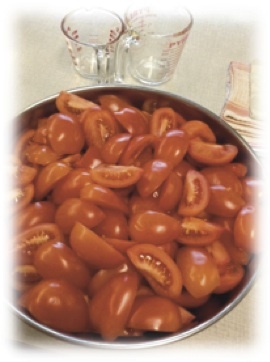 Press heated tomatoes through a sieve or food mill to remove skins and seeds. Place juice in a saucepan and heat to boiling. Acidify (see Table 1). If desired, add 1 teaspoon of salt per quart jar. Fill jars with hot tomato juice, leaving one-half inch of headspace. Adjust lids and process jars as described in Tables 2 and 3. What causes tomato juice to separate in the jar? Liquid at the top and solids at the bottom indicate that the juice was made before heating (perhaps by running tomatoes through the steamer, sieve or food mill raw). To minimize the separation of juice, leave tomatoes whole or in large chunks (do not chop), then heat before juicing. Use approximately 22 pounds of tomatoes for a canner load of 7 quarts. No more than 3 cups of other vegetables should be added for each 22 pounds of tomatoes. Crush and simmer tomatoes as for making tomato juice. Add no more than 3 cups of any combination of finely chopped celery, onions, carrots and/or green peppers. Adding more than 3 cups of other vegetables may result in an unsafe product. Simmer mixture 20 minutes. Press hot, cooked tomatoes and vegetables through a sieve or food mill to remove skins and seeds. Reheat tomato-vegetable juice blend to boiling. Acidify (see Table 1). If desired, add 1 teaspoon of salt per quart. Fill clean hot jars, leaving one-half inch of headspace. Adjust lids and process jars as described in Tables 2 and 3. Use approximately 35 pounds of tomatoes to yield 7 quarts; an average of 21 pounds will yield 9 pints. A bushel yields 10 to 12 quarts of sauce. Use approximately 46 pounds of tomatoes to yield 7 quarts; an average of 28 pounds will yield 9 pints. A bushel yields 7 to 9 quarts of sauce. Prepare and press tomatoes as for making tomato juice. Simmer in a wide saucepan until sauce reaches desired consistency. Volume is reduced by about one-third for thin sauce, or by one-half for thick sauce. Acidify (Table 1). If desired, add 1 teaspoon of salt to each quart jar. Fill jars, leaving ¼ inch of headspace. Adjust lids and process as described in Tables 2 and 3. Do not increase the proportion of onions, celery, peppers or mushrooms. To do so will result in an unsafe product. Wash tomatoes and dip in boiling water for 30 to 60 seconds or until skins split. Dip in cold water and slip off skins. Remove cores and quarter. Boil tomatoes 20 minutes, uncovered, in large saucepan. Put through food mill or sieve. If desired, sauté onions, garlic, celery, pepper and mushrooms in vegetable oil until tender. Combine sautéed vegetables and tomatoes; add salt, spices and brown sugar. Bring to a boil. Simmer, uncovered, until thick enough for serving. At this time, the initial volume will be reduced by nearly one-half. Stir frequently to avoid burning. Fill pint jars, leaving one inch of headspace. Adjust lids and process as listed in Table 2. Wash tomatoes. Dip into boiling water for 30 to 60 seconds or until skins split. Dip in cold water. Slip off skins and remove cores. Quarter tomatoes into a 4-gallon stock pot. Add onions and red pepper. Bring to a boil and simmer 20 minutes, uncovered. Cover, turn off heat, and let stand for 20 minutes. Combine spices in a spice bag. Pour vinegar into a 2-quart saucepan and add spice bag. Bring to boil. Remove spice bag and combine vinegar and tomato mixture. Boil about 30 minutes. Put boiled mixture through a food mill or sieve. Return to pot. Add sugar and salt, boil gently, and stir frequently until volume is reduced by one-half or until mixture rounds up on spoon without separation. Fill pint jars, leaving ⅛ inch of headspace. Adjust lids and process as described in Table 3. An average of 12 pounds of tomatoes and 4 pounds of okra or zucchini is needed per canner load of 7 quarts. An average of 7 pounds of tomatoes and 2½ pounds of okra or zucchini is needed per canner load of 9 pints. Wash tomatoes and okra or zucchini. Dip tomatoes in boiling water 30 to 60 seconds or until skins split. Dip in cold water. Slip off skins, remove cores and quarter. Place in stockpot. Trim stems from okra and slice into 1-inch pieces or leave whole. Slice or cube zucchini if used. Bring tomatoes to a boil and simmer 10 minutes. Add okra or zucchini and boil gently 5 minutes. If desired, add 1 teaspoon of salt for each quart or ½ teaspoon per pint. Fill jars with mixture, leaving 1 inch of head space. Adjust lids and process as described in Table 2. What causes the deposit around the top surface of some tomato products? A white, crystalline deposit of calcium acetate may form in highly acidic tomato products such as chili sauce, ketchup or salsa. Reactions between the acid (acetic acid) in the food and a component (calcium carbonate in some brands of lids) form calcium acetate. The crystalline deposit is not harmful. When opening the jar, remove and discard the crystals. Listen for the familiar "ping" as the jars cool. Look for the slight depression in the lid's center. When completely cooled, test for proper seal by pushing down on center of lid; lid should not pop up and down. Allow the canned foods to cool on the counter top before removing the ringbands. Jars should not be stored with the ringbands on. After removing the ringbands, wipe jars with a clean, damp cloth to remove any residue or stickiness. Add labels with date, batch, food product and any other special information. Store jars in a cool, dry, dark place. University of Georgia, College of Family and Consumer Sciences. "National Center for Home Food Preservation." nchfp.uga.edu/index.html.